This is how most people discover new content today but it’s also how most of us waste a lot of our precious time. So how can we organize our online reading habits in a way that makes reading time more efficient and helps us discover new, valuable content in the process? That’s where Feedly comes in – it’s by far the best tool for streamlining how we read blogs. Feedly has some amazing features that will help you collect and read content from all your favorite blogs in one place. In this article, I’m going to show you how to use Feedly effectively! Feedly is a web-based, news-aggregation service. If any site provides content in RSS (Real Simple Syndication), you can add it to Feedly and then read that blog’s content on Feedly on your desktop or mobile, instead of going to the source site. You don’t have to check whether a blog has updated or not, you just go to Feedly and all the new posts are in one place. When it comes to Feedly pricing, there is a very good free option and a low-cost, paid option with more features, plus an option that’s suitable for teams. 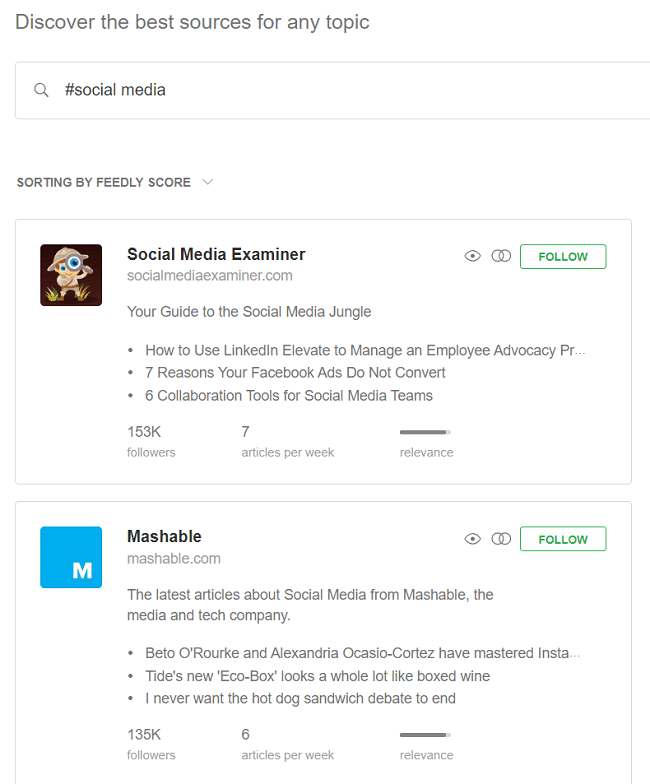 Feedly lets you categorize the blogs you follow into feeds so you can easily group similar topics together. When you have content in one feed, you can view everything from that feed and ignore the other, less relevant feeds. You might have a feed for personal stuff, a feed for influential bloggers, a feed for friends who blog, etc. To define your feeds, you first need to find something to add to them! A subscription is a feed of content from a particular blog (or news site). There are a couple of ways of adding subscriptions. a) As we showed above, you can do a search using a hashtag in Feedly and it will display external sites related to the term you search for. You can then add this subscription to your feed or create a new feed. b) You can select the ‘add content’ option (bottom left of Feedly) and this brings up a search box where you can search through millions of news sources. c) You can import feeds that you may have from other RSS reader applications. You will need to export the feeds into a format called ‘OPML’, which is a list of the feeds you have subscribed to before, and then import them into Feedly. d) The Feedly subscribe button. This handy little tool is available as a browser extension and makes it easy to subscribe to the blog you are reading. Chrome users can install the Feedly subscribe button here. Then, whenever they are visiting a website that has an RSS or Atom feed, the Feedly icon appears in the address bar. When you click this button, the tool provides you with links to all the feeds on the site. You will nearly always want to choose the main feed, rather than the comment feeds. When you click on the feed you want to subscribe to, the tool takes you directly to that website’s page in Feedly, where you can subscribe and add it to a feed. When you are reading content from the blogs you have subscribed to, you can set up a reading style and this can be different for each blog. 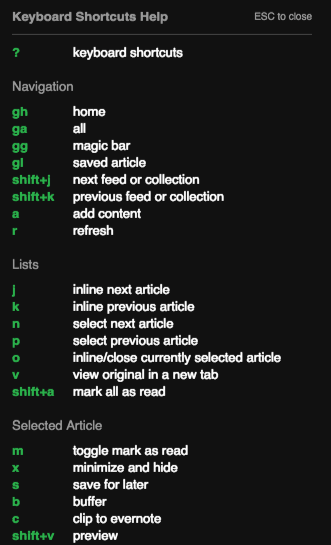 This is one of the really cool Feedly features. Title only – This just displays a list of titles. You have to click on the title to view details. Magazine – The most popular articles are displayed on top and then you see a list of articles, which includes an image and a summary. Cards – Articles are displayed with image and text in a rectangular card type format. This is the format I generally use. Article view – When the owner of the content has set up a full-article feed, you can view the full article within Feedly. Delete the article – The article will not be displayed in the feed any more. Mark it to ‘read it later’ – There is an icon on the top right hand corner that allows you to tag posts with ‘read it later’. You can then view a filter of your ‘read it later’ articles. Save it to Evernote – This is a Pro feature. Tag it – You can add a custom tag to an article so you can filter at a later stage based on the tag (e.g. ‘great article’ tag). Email it – You can email it to yourself or someone else. Share it – There are a wide variety of sharing options, although some of these are a Pro feature. You can share to Twitter, Facebook, Buffer, and many more channels. The pro version also supports IFTTT, which helps you automate sharing to a whole load more of apps! Feedly provides a really good mobile app so that, when you are out and about, you can catch up with your articles. When you have 10 minutes to spare, take out the mobile app and catch up on your reading. Upgrade to a phone with a reasonable-sized screen, which makes it easy to read. Out of all the content you are subscribed to, you can tell Feedly which feeds are the most interesting to you. I couldn’t find a menu item for this but, if you are logged into Feedly, click here. On this screen, you can edit the subscriptions. You can also highlight the ones you are most interested in by selecting the star (see the blue star below). Feedly will give priority to those blogs in the feed. Now that you know how to use Feedly, let’s take a look at some other useful features it offers beyond its core functionality. 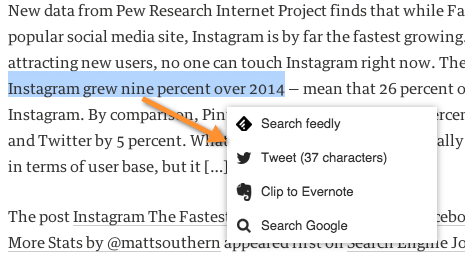 a) If you highlight any text when you are reading, Feedly gives you some extra options, e.g. share it on Twitter. b) In preferences, you can set up the default tools you want to share to. For example, Buffer is not automatically listed as a default tool but you may want to add it to the list and remove others. ‘Preferences’ is available on the bottom-left part of the screen. c) In preferences, you can set up integration with Dropbox so your favorite articles are automatically saved. This is a Pro feature. Advanced search of your feeds. Fetch stories up to five times more quickly. Support for IFTTT and Zapier, which gives you more automation capabilities. Custom sharing – You can set up sharing to other tools not on the default list. Access to the newest features first. Feedly is one of the best applications for catching up on blog posts and it’s free component is very comprehensive. For me, it’s really the easiest way to curate content from my favorite publications for social sharing – I can save posts or share them on my social accounts directly from the Feedly interface. You can also get a Feedly mobile app, available for both iOS and Android. Now that you know how to use Feedly and all the great features it offers, are you going to give it a try? Or is there a similar tool that you use and would reccomend?